Setup, configuration and operation instructions. Each time the TM6 is switched on, the Engine Stop temperature will display for 3 seconds. This allows the operator to check the setting is still correct. This is the main display message seen most of the time.. This indicates the current temperature of the sensor (or engine). Indicates high temperature has stopped the engine and the unit needs to be turned off in order to reset it. The message remains until the unit is switched off. At any time during the Automatic Bypass, the front switch can be pressed to take manual control of the bypass time. As long as the switch is held down, the manual bypass will continue. Releasing the switch while in manual bypass, will cancel the Auto Bypass. The small black loop of wire at the cable entrance determines which of the two voltage output configurations the TM6 will operate on. Setting A. If the loop is joined. The output voltage on the yellow wire will be continuous while the engine is running, then go off on a fault and stay off until the unit is reset. Setting B. If the loop is cut. There is NO output voltage on the yellow wire while the engine is running, 15 seconds of voltage on a fault, then no voltage until the unit is reset. Press the 'Set Alarm' switch down until this message appears. Continue to hold the switch down for 8 seconds until the message below appears. You have now accessed the main Temperature Alarm settings. Whatever number is displayed when the unit leaves this program becomes the new Stop Temperature. To observe the stop temperature without altering it, release your finger and wait. To move the temperature forward repress the switch once more. If you continue to repress the switch, one press at a time, the alarm temperature will move forward one number at a time. If you hold the switch down at any time after the first repress, it will advance at high speed. If you lift your finger for more than 3 seconds the unit will leave this program and return to the main display message. Note - The counter scrolls in a forward direction only. It will go to 127 and then return to 1. - When the counter gets to 100 it will stop, this is used to speed up the production of the TM6 in the factory. Repress the switch to get it to advance forward again. 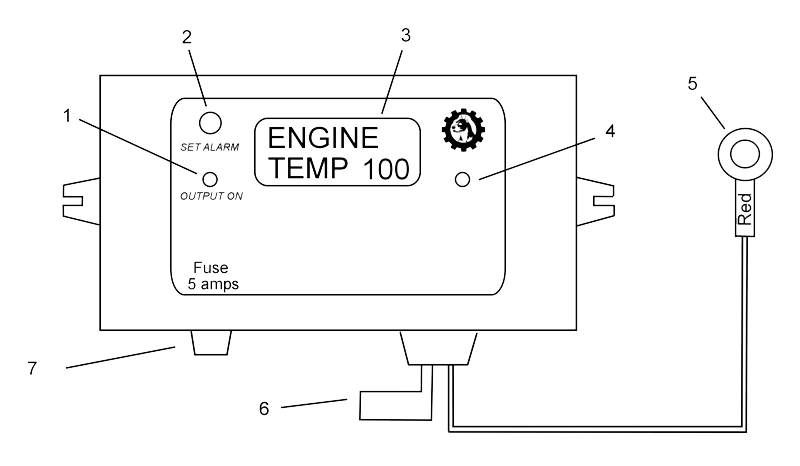 If the engine is stopped the unit will activate on the oil or auxiliary alarms before you have time to access the stop temperature program. For this reason it can only be accessed while the automatic bypass message is displayed. Follow the new procedures below until you gain access to the Stop program and then follow the normal procedure as out lined above. Press the Set Alarm button BEFORE the unit is powered on. Once access is gained, each time the button is pressed and then released, the bypass time will increase by 10 seconds. It will go to a maximum of 240 seconds and then return to 1. The TM6 will NOT read minus temperatures. If the sensor temperature is below zero degrees Celsius, the TM6 will display <1c. If it is at zero degrees, it will display the second message. While these messages are displayed the temperature stopping alarm will NOT operate, however the oil and spare alarms will continue to operate normally. If the sensor is obviously not at zero degrees Celsius and this message appears, then the TM6 is no longer receiving readings from the sensor and is N/c (Not connected). While this message is displayed the Temperature Stopping Alarm will NOT operate until such time as the sensor fault is fixed. The oil and spare alarms will continue to operate normally. The most likely cause of this fault is either the WHITE wire or the SHIELD in the sensor cable has been crushed or is open circuit. CHECK for obvious damage to the cable or any joints. Also look for hidden damage to the cable such as under over tightened cable ties and at flex points. Alternatively replace the sensor. If the TM6 has obviously stopped working correctly and is just displaying the temperature 85, check the sensor cable. While this state exists the stopping temperature alarm will NOT operate until such time as the sensor fault is fixed. The oil and auxiliary alarms will continue to operate normally. The most likely cause of this fault is the RED wire in the sensor cable has been crushed or is open circuit. Follow the CHECKING procedure above. Standard power and sensor cable length, 1.8 metres. If you need a copy of the Engine Watchdog TM6 wiring diagram, you can download our printable PDF version.